Excellent product. Restored a very old sealed battery and maintains newer batteries at a healthy level of charge. Easy to use. Charged up my bike battery quickly and well and now I have a short lead and socket permanently attached to the bike to keep it plugged in when not in use. Great! Bought for my motorcycles on recommendation and not disappointed with the product. The delivery and overall service from Tayna was simple and prompt. brilliant...does exactly as it says...no hassle...rejuvenates my battery and I can leave it on till the next time I use it and its very safe. Using product on 2003 BMW Z4 Roadster. It sits around and gets driven every 2 - 3 weeks. The CTEK XS800 is doing a great job keeping the battery topped up. Used it for 2 weeks now. Checked indicator and level is full. 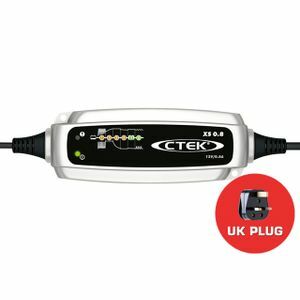 CTEK products are easy to use. Just plug and play. Will be using item all year round. Superb build quality,simply the best vendor and product with lightning delivery time.Thanks guys. Having bought two of this type of charger for deep discharge batteries previously, two more were required to keep a bank of six batteries on top form. Won't charge batteries that have run flat. You have to start charge with a simple charger before then attaching this one. It will not recognise that it is attached to a battery unless you do that. A great charger for batteries with juice left in them. Lots of great features. Nice looking. I have had several of these over the years. They work very well for 2-3 years then gradually fade & die. I have reverted back to a traditional charger. Excellent - better than Optimum! Reasonable price, delivered quickly, If is saves one battery each tear it will have paid for itself in 6 months. Bought to keep my classic car battery ready for use. Ideal to leave on permanently.